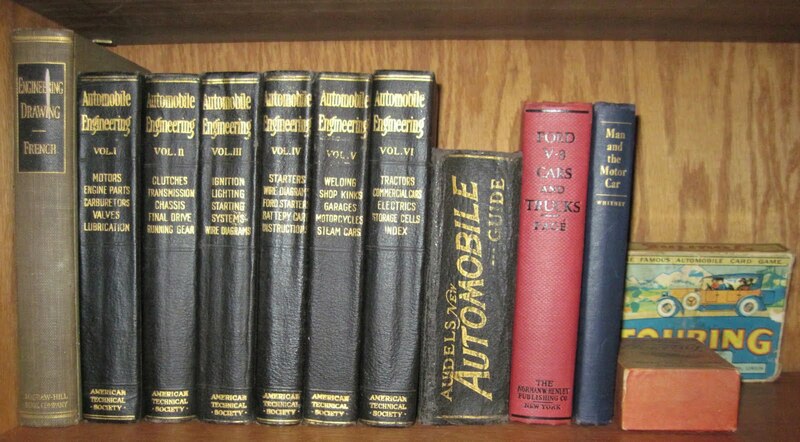 Last time I opened these books I shared some pages on basic 4 stroke engines. 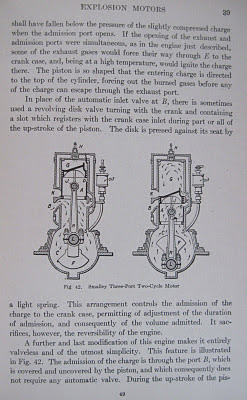 This week I’d like show you the section on 2 stroke engines. 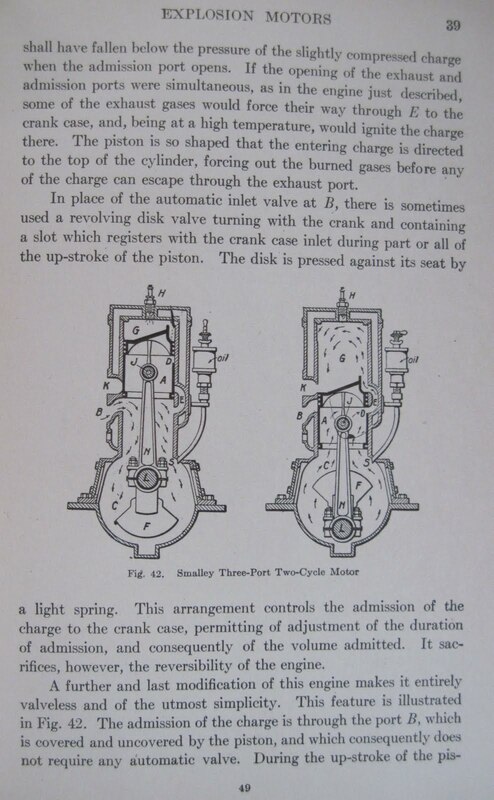 Perhaps the biggest advantage of two stroke engines is the simplicity of the design. By using ports in the cylinder wall it is possible to build an engine with one valve or even none at all. The other, perhaps more obvious, advantage is that unlike the 4 stroke Otto cycle design you get a power stroke every revolution, so power tends to be quite good compared to heavy and more complex engines. This is however one of the great weaknesses of this engine types as well, because by condensing the intake, compression, power, and exhaust into half the number of strokes, you end up shortening the power and compression as well as overlapping the intake and exhaust. These changes really cut into your efficiency as high compression and a long power stroke are needed to thoroughly burn fuel. The overlapping of the exhaust and intake also cost some efficiency by allowing fuel to escape through the exhaust port. Add to that the constant flow of engine lubricant through the crankcase to the cylinder and you’ll always have plenty of unburnt oil products blowing out the tailpipe. Considering all that, it isn’t surprising that two strokes aren’t common in the automotive world. Where they tend to excel is in small handheld tools (blowers, weed whackers, chainsaws, etc) where weight and power are the primary concerns. The fact that the two stroke appeared so prominently in this text is testament to the fact that in the 1920s people were still very unclear on where the automotive industry was headed. Of course, the American Technical Society was not shy about including extra information in this text. 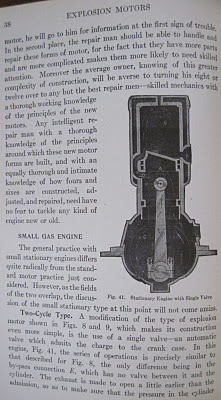 In fact they actually put in a section on aircraft engines. Brigid mentioned the Antoinette engine in the comments so I did a little looking. I had no success in my old texts, but I did come across a real aerial oddity while I was looking. So, find your white scarf and we’ll take off on a tangent. This is a Frederickson 70 hp rotary engine. Actually, I should say that again. This is a ROTARY engine, meaning the crankshaft is fixed and the cylinders rotate, unlike a radial engine where the crankshaft turns instead. Having the engine rotate may seem a bit odd, but during the early years of aircraft development this configuration did hold some advantages compared with some of the other options available. This approach could produce a reasonably lightweight design without the need for flywheels or cooling systems. Of course I wouldn’t want to ignore the fact that you were mounting a rather large spinning mass on the front of a light weight machine that has only its wings to provide opposing torque. That’s not necessarily a problem if you only need to turn in one direction, but it’s certainly not conducive to straight and level flight. Still, rotary engines like the Gnome Monosoupape (single valve) kept much of the early air power aloft. The Frederickson design is apparently an oddity even for a period rife with failed experimental designs. It’s a two stroke five cylinder rotary design. There were only a handful of two stroke rotary designs, and from what I understand the commercial success of these was quite limited. The lack of valves and their accompanying pushers, cams and reduction gears does hold considerable appeal when constructing an aircraft engine, but there is one very noticeable drawback. Two strokes depend upon the compression of the fuel air mix in the crankcase to properly charge the cylinder during intake. 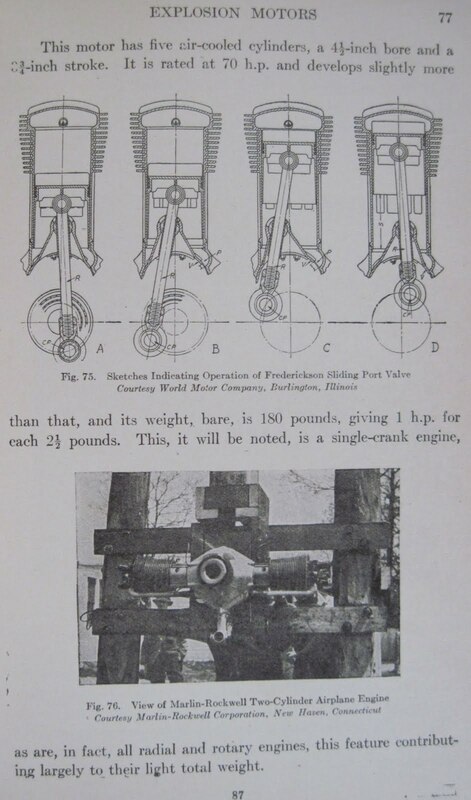 That doesn’t work very well when you share a crankcase with four other cylinders at different points in their stroke. 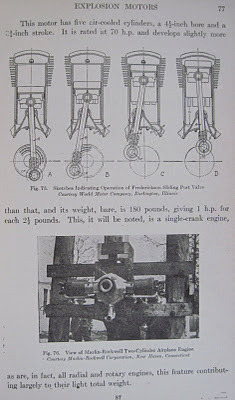 To get around this, I understand some designs like the Murray Willat Lamplough 6 cyl 2 cycle Lamplough used a blower system to maintain positive pressure on the crankcase. 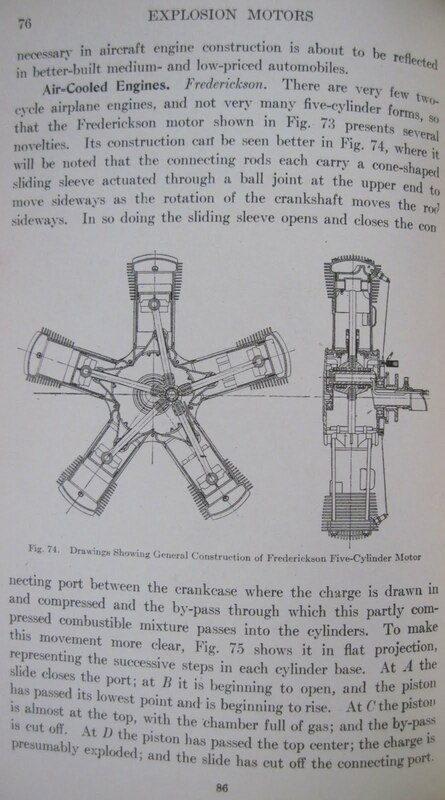 Frederickson took a fairly simple approach and used a sleeve attached to the connecting rod by a swivel. The lateral motion of the rod (relative to the cylinder) would move this sleeve back and forth, opening a port to admit the fuel air mix when the piston on the compression stroke and seals it on the power stroke thereby compressing the mixture prior to the intake phase. It’s actually quite a neat solution even if it might not be the best for maintenance. By the time this design was developed, rotary engines were starting to fall behind their radial and inline counterparts. Rapidly improving design and manufacture meant that engines were becoming more reliable and able to rev to higher speeds, while rotary engines encountered dramatically greater wind resistance and higher structural stresses as the rev speeds went up. 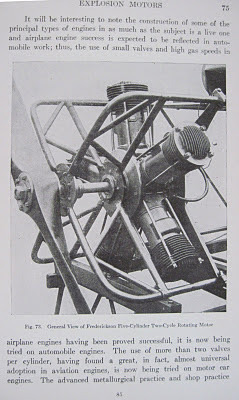 Engines like the V8 Hispano Suiza became increasingly popular as did various flavors of radial engines. While the Gnome Monosoupape engine (probably the most common rotary design during the war years) topped out near 150hp, designs like the Hispano Suiza 8 cylinder entered production at 150 horsepower and quickly evolved to models producing well over 200 horses. 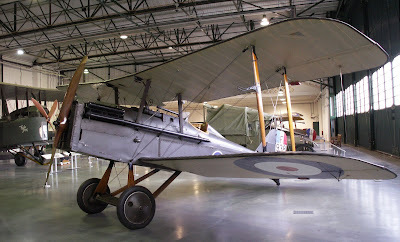 These provided power for planes like the SE5a and various generations of Spad designs which had a significant impact on the balance of air power in 1917 and 1918. I’ll start digging for more good tech manual material and see if I can come up with anything interesting for next time. "Take off on a tangent". Is that sort of like "storming off in a huff"? (The huff being, I believe, a small British automobile). When you look at the advancement in engines and the short time frame such technology evolved it sort of makes our whole ipod/Apple/look a flat screen TV! era seem a little less impressive. As someone who is lacking education in internal combustion engines, these posts have been interesting. My field was electric motors, generators, and power transformers. Brigid, If you storm off in a huff but come back in a TR6, would that be a triumphal return? Bob, Thanks. I like old texts like this because they give you a view of things you don't often see in modern handbooks. I'll admit I'm not so sharp with electrical work. 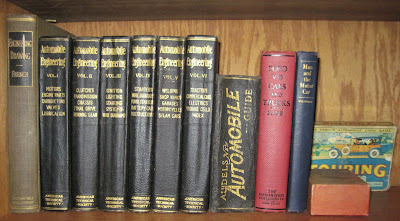 Maybe I should spend some time with my Audel's New Electric Library.